Our Extreme Fundraiser - Howl from Great Heights is planned for Saturday, June 4th at Skydive Carolina in Chester, SC, and is being organized by She D'ambrosio. At least 11 skydivers and volunteers are needed to work the event. If you are interested in jumping, volunteering, or sponsoring a jumper (it will be a $500 minimum pledge to jump; all jumpers must be 18 and must sign a release), please contact She D'ambrosio. To make a donation to sponsor a jumper, please contact Nancy, or use the PayPal link on our site (please specify that it's for the Howl from Great Heights). You may also send a check to Full Moon Farm, PO Box 1374, Black Mountain, NC 28711. You may donate any amount, but if you are donating towards a specific person's jump, please let us know. We are hoping to have other activities, and of course, River will be there! We will have more information on our website after April 15th. Please note that, should the event be canceled due to an inability to meet the minimum participation requirements, all donations will be converted to a general donation to support the wolfdogs at Full Moon Farm. We did a little rearranging on the 19th. Juneau had been by himself since he'd come back, and we wanted to put someone with him. Aslan had been sad since Dakota Grey had passed, and we wondered if she might benefit from having another penmate. She's also rather shy, while Juneau can be a bit of a goofball (especially with people he really likes). It was thought that the two of them might work well together, so they were introduced. Juneau was head over heels for a new girlfriend! (Glacier is jealous and wants a girlfriend, too.) Aslan was a bit more reserved at first, but has warmed up to him. They've been doing great together! James, Jay, Cory, Drew and Trey finished a new pen that afternoon, and Sinjun and Sky were moved into it. They'd been residing in neighboring kennels behind the cabin, and had been very shy in them. Sinjun would let you pet him, but it didn't seem like it was his favorite thing. Sky was too timid to approach. Once they were in the new pen, they willingly came up to the volunteers in there to sniff them and get skritches! They then wandered around their new digs, checking everything out. We were overjoyed with their response! Wraith and Sophia were very happy to see their new neighbors, too. We're very pleased that they're doing so well in their new pen. We've found homes for two of the puppies, but two of the darling girls remain. They're getting a little bigger and have started going out on the leash (one at a time). They are incredibly curious, very playful and love any and all attention. Potential owners must have wolfdog/northern breed and/or GSD experience, a fenced yard and must pass a home check. If you are interested, please contact Nancy at nancy@fullmoonfarm.org for more information and an application. Puppy photos by Michele Frankl. The woofers who joined us over the summer are now healthy enough to be spayed or neutered. Not only will this help their overall health, but it will help us move them into larger pens (can't have unaltered couples together!). Nancy has set up a Chip-In account to collect funds for this. You may also donate via our PayPal link (please specify that it's for the spay/neuter fund) or you may send a check to our vet, Animals R Us, 725 Crest Rd., Flat Rock, NC 28731 earmarked for the Full Moon Farm account. We are grateful for any and all assistance! Also, the Savannah Boy is doing very well. He will be having his second surgery next week to remove the pins in his leg. Our thanks to everyone who has donated to help him! We are still about $600 short for his operation. Nancy has been calling him He-Man, as he has become a "brother" to her dog, She-Ra. We do thank everyone who has sent in name suggestions, but Nancy has had several people apply to adopt him, and every one of them has requested to name him should they be chosen as his new home. Photo of Satchmo by Michele Frankl. Our first Howl-In of the year will be Saturday, April 16th. Tours of the Farm start at 3:00 p.m.; potluck supper begins at 5:00 p.m. Bring a side dish and join the fun! For info and directions, please call 828-664-9818 or email info@fullmoonfarm.org. Our full Howl-In schedule is available here. We are also looking for any grocery stores, restaurants or cafés that would like to become a Pack Patron by contributing the main entrée for 60 people for each month's Howl-In. For more information on that, please contact Sarah Hallback at sarah@fullmoonfarm.org. Photo of Mya howling by Sharon Greene. This month, it's Odin and Pookha! Odin and Pookha (along with Missy and Star) came to the Farm in 2005. Their owner, a local breeder, had gone out of town and all of her animals had gotten loose. The most aggressive of her animals had been shot, presumably by a neighbor. Animal control and Nancy had been asked to help catch the remaining animals. The owner was allowed to keep her two oldest animals, which were more like pets, but her breeding animals had to be surrendered or else they would be euthanized, so they came to the Farm. None of these animals had been properly socialized. Odin is one of our barkheimers. We can always tell if someone is up near his pen, because he will bark non-stop until whoever is up there leaves. He is a very striking animal, not the least of which is because of his different-colored eyes. He is not friendly, and will not approach people. While you're in the pen, he follows several feet behind, and sniffs where you've walked, but if you turn, he darts away. He doesn't want people getting anywhere near him. Pookha is incredibly shy. When people approach, he retreats to the far corner of their pen. (In their old pen, which was smaller, Odin would go to the same corner and pretty much stand on Pookha's head and bark!) This behavior earned him the nickname "Pookha Pookha No-Legs." However, when it's quiet, and no one else is around, he has been known to play-bow and bounce around with the person outside the pen. The two conditions for that are it must be someone he knows well, and there have to be no witnesses! Photo of Odin and Pookha by Sharon Greene. We will have booths at both the Asheville and Charlotte Pet Expos. The Asheville Pet Expo is April 2 - 3, 2011 at the WNC Agricultural Center in Fletcher, NC, across from the Asheville Airport. Adult admission is $7.00; kids 15 - 6 are $5.00, and 5 and under are free (they have a coupon for $1.00 off admission on their website). Parking is free. Leashed pets are welcome. Nancy will be speaking on the 2nd at 2:30 (20 - 30 minutes) and on the 3rd at 3:15 (20 - 30 minutes). We are looking forward to reaching more people in the Asheville area! The Charlotte Pet Expo is May 21, 2011 from 10:00 a.m. to 6:00 p.m. at the Park Expo Center, 800 Briar Creek Road, Charlotte, NC 28205. Admission and parking are free. Pets are welcome. Nancy will be speaking but times have not been announced yet. We are accepting donations to cover the cost of the booth fees - $199 for Asheville and $325 for Charlotte. To donate, please click here. Thank you for your support! Animal Adventures in North Carolina by Jennifer Bean Bower was published this month. Full Moon Farm is one of the featured stops in her book. There is also a blog post, "Austin and Santino go on an animal adventure," about the book and the Farm. Our thanks to Ms. Bower for including Full Moon Farm in her book! Ms. Bower will be doing a book signing at the Barnes & Noble located at the Town Square at Biltmore Park, 33 Town Square Blvd., Ste. 100, Asheville, NC 28803 on April 30th at 11:00 a.m. FMF will be there with River. If you're in the area, please stop by to purchase a copy, get it signed and say hello! Our first Wolf Art Show and Sale will be at the Battery Park Book Exchange and Champagne Bar on Tuesday, May 24th from 6:00 - 9:00 p.m. FMF volunteer Trey Merrill will be performing. We are looking for any artists or sponsors who would like to donate wolf-themed items to sell for the show. For more information, please contact Sarah Hallback at sarah@fullmoonfarm.org. We hope you'll join us there! Photo of River at the Battery Park Book Exchange by Lily Cascio. Our thanks to Blaze-N-Skky Pet Boutique for letting us table outside on March 12th. Everyone (including River) had a great time! If you are spring cleaning and wanting to get rid of some gently used items, we are looking for items to sell in yard sales or on consignment at Bella's of Asheville. (Please, no shoes or clothing.) If you are coming out to the Farm, you may drop your items off. If you are local, we may be able to arrange pickup. For more information, please contact Sarah Hallback at sarah@fullmoonfarm.org. Thank you! Our thanks also to Bella's of Asheville. While the winter was mild, we still have tree work, driveway and culvert repair, and pen rebuilding that need extra hands. We are also in need of donations of gravel, backhoe and bobcat work. We are also looking for donations of 4' fencing material for our interior perimeter fence and labor for our fireline cleanup project. If you can help with this, or any other items on our Wish List, please contact Nancy. 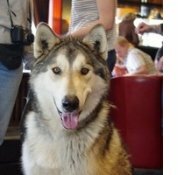 Nancy and River are available to give free talks to civic groups, schools and other organizations about responsible pet ownership and wolfdog mythbusting. (Well, Nancy talks; River comes along to meet people.) To book them, please contact Nancy.